If your kids are interested in Pokémon, be excited! 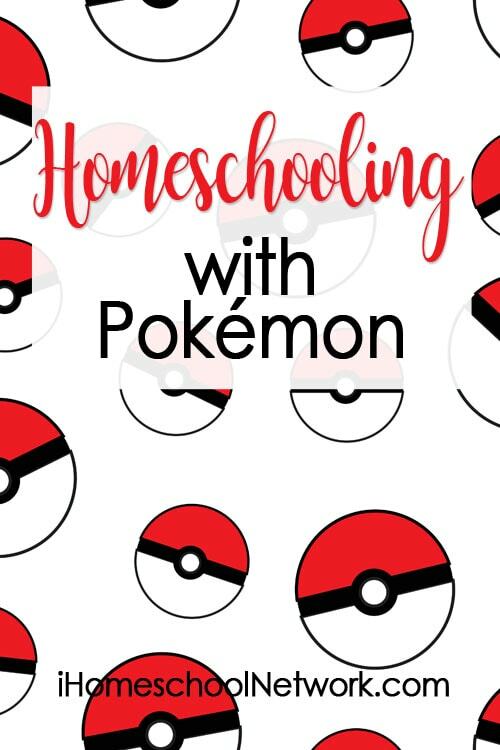 You will be amazed at the ways you can capitalize on their interest by homeschooling with Pokémon. Have you heard your kids talk about Pikachu, Squirtle, and Charizard? Do they discuss attacks, trainers, and “evolution”? Sounds like your kids might be into Pokémon—which is great for you. Believe it or not, they’re going to learn a ton of stuff! Pokémon began many years ago as a trading card game and eventually grew to include video games, books, movies, and a TV show. In 2016, Pokémon became popular again for a newly released location-based, augmented reality game/app called Pokémon Go. When my two sons became interested in Pokémon years ago, I thought it was just a silly game—but I also wondered how I could capitalize on their interest by making Pokémon a part of our homeschooling. There are many neat Pokémon based activities that you can add to your day if you’re looking for something extra. Pinterest – search Pokémon Homeschool for many more ideas! Don’t feel that you need to make Pokémon extras a thing, however. Sometimes the addition of too many interest-based extras can actually backfire on the interest! By simply watching my sons play the Pokémon card game and video games, I quickly discovered that I really didn’t need to do anything extra—my sons were learning in many different areas that I never would have thought Pokémon could help with. In order to play the game your kids will need to do math. Now, don’t let this concern you if you think your kids struggle with math. I can tell you from experience that it’s not uncommon for a kid who can’t complete a worksheet to suddenly be able to perform multiple level computations in his head and tell you his score after each and every battle in Pokémon. Go with it. Once again, it was always amazing to watch kids who “didn’t have an interest in reading” or struggled with reading in general, and how they would plow right through a game of Pokémon and not even realize all the reading they had to do in order to play the game. This goes for the card game as well as tech based versions of the game. I know one mom who said her child really improved in reading because he wanted to play the Pokémon video game, but she was often busy with siblings and couldn’t tell him what it said on the screen. What’s also interesting is what your kids will learn about etymology—the origin of words and how they are put together. The hundreds of characters in Pokémon are all named for specific reasons. You might find your kids picking up on some Greek or Japanese root words (and many others!) as they work through the names of the Pokémon they’ve captured. Heliolisk is named for helios (Greek for sun) and basilisk (a type of lizard). Kyurem is named for kyuurei, which is Japanese for ‘rapid cooling’. As the creatures of Pokémon evolve (which means that they change form, type, or ability as they level up), their names will also change. Your kids will come to realize that the way the Pokémon names change makes sense and helps your kids keep track of who the creatures are. For more information on Pokémon etymology, visit the Pokémon Database. When your child discovers that Kangaskhan was named for Genghis Khan (the Mongolian leader) or that Natu was named for Atu, the first man in Samoan mythology, you might find that a new interest is sparked in different histories and cultures. Pokémon was started in Japan. Because of my children’s interest in Pokémon, it was natural that they became very interested in Japan. This led to endless hours of researching Japanese language, food, and history. When we started our homeschooling journey, I never would have imagined that Japanese culture and history would be something we’d spend a ton of time on, but my sons (and Pokémon) certainly proved me wrong. Pokémon Go is clearly something you will want to check out before you let your kids run with this. It’s an app that takes you on an adventure a little like geocaching, but instead of looking for a physical cache, you’re trying to capture a virtual Pokémon. My sons were 12 and 13 when this game hit big, and really had a fun summer heading out in our small town and neighboring communities to see what they could find. What surprised me most about my kids playing Pokémon was the many things they had to keep straight, all at the same time, in order to play the game. I’m not going to lie: there were times I was totally confused and they were miles ahead of me. It gave me hope that they really can keep it together—and that’s reassuring to a homeschool mama’s mind! As my kids got older, they got into trading cards with other players, and eventually they were looking for specific cards to purchase online or at local vendors. It was interesting to watch my kids—who normally wouldn’t say boo to a stranger—suddenly know how much a card was worth and be willing to negotiate with a vendor for that card. Those are life skills right there! If your kids are interested in Pokémon, be excited! It’s more than just a simple game. Encourage your kids to explore the many worlds that Pokémon can open up for them. You will all be amazed at the things they can learn. Amy Dingmann lives in Minnesota with her husband where they have been homeschooling their two sons since 2007. Her hobbies include filling up her sons’ bottomless pits, drinking a lot of strong coffee, and smiling. Her least favorite subject is math. Her favorite subjects are everything else. She likes talking to other homeschooling parents and assuring them that even though they worry they’re totally screwing things up, they actually totally and completely rock. Amy blogs at The Hmmmschooling Mom, and works as an author/speaker on homeschooling and parenting/family topics. You can find her books on her Amazon Author Page. My kids talk a lot of science when they play Pokemon too; they talk about water types beating fire types and how that makes sense because water beats fire, etc. I have been amazed at all my boys have learned by immersing themselves in all things Pokemon.